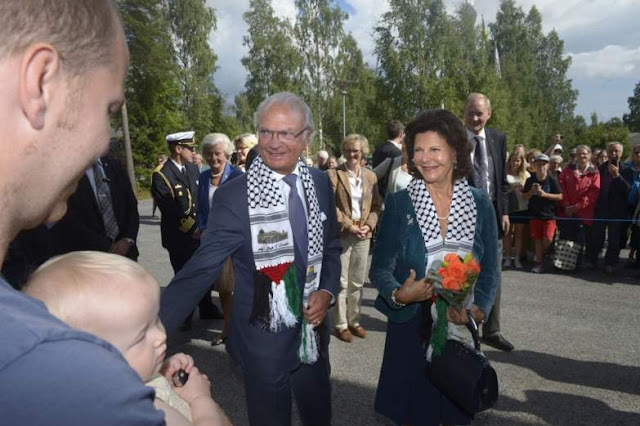 During a tour of Sweden to celebrate 40 years of the reigning royals, King Carl Gustaf and his wife, Queen Sylvia, visited the neighboring area of the city of Sundsvall. There they were approached by a man who identified himself as an Iraqi refugee, and who gifted them with hand made keffiyehs, the traditional Arab scarf, as a thank you for allowing him to start a new life in Sweden. He then asked them to pose for the camera with the scarves. Unbeknownst to the royal couple, however, the keffiyehs were adorned with an anti-Israeli inscription: "Al Aqsa is ours and is not their temple." This fact that came to light only after the photo was published, Yedioth Ahronoth reported. The pictures caused ripples of reaction throughout Sweden. Pro-Palestinian organizations expressed satisfaction with the support the royal couple showed with regards to the Palestinian right over Jerusalem, while others riled at the fact that the King and Queen—even unwittingly—served as a part of Palestinian propaganda. "On their visits to various parts of the land, the royal couple meets many people," said Bertil Ternert, spokesperson of the Swedish royal house, to Yedioth Ahronoth. "In this case, the man placed the keffiyehs on the King and Queen so quickly, that there was no possibility to take the scarves off before the couple posed for the camera. Shortly after the photo opportunity the King and Queen took off the keffiyehs. We want to stress that the acceptance of this gift holds no political statement of any kind." Here is an example of how clueless the EU intelligentsia are. Michael Schulz, Associate Professor of Peace and Development Studies at the University of Gothenburg says that there is often strife in the area. - "Jewish religious nationalists are trying to establish a Jewish temple there, 1990, an offensive that resulted in gunfire and bloodshed," he says. Even Michael Schulz believes that the text of the shawls is a political / religious slogan. - It's hard to tell if the message is anti-Jewish or anti-Israeli. Most likely it is a mark against the Israeli occupation of Palestinian territories. Of course. Because the only problems any Muslims have with Jews is "occupation." That's the breadth of understanding of a professor of "peace and development studies."